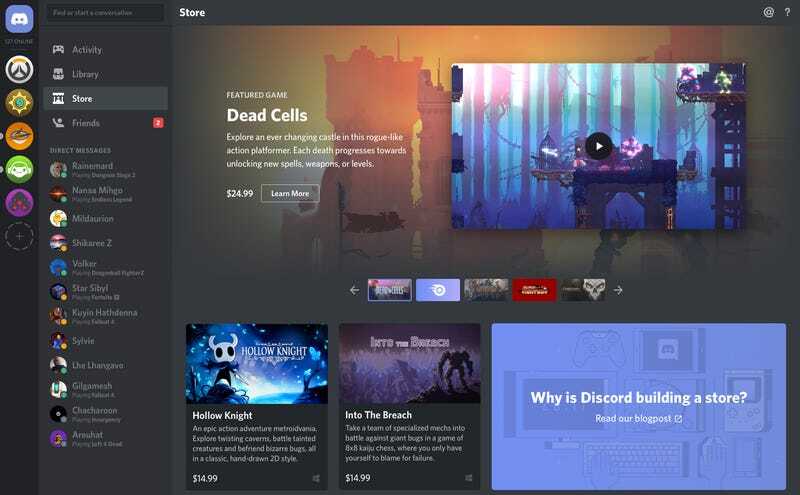 Back in June, ubiquitous chat company Discord launched a games tab that bore a slight resemblance to Steam’s front page. Now it’s launching its own store that resolutely refutes Steam’s anything-goes approach. “We’ll be launching a curated game store experience similar to one of those cozy neighborhood book shops with recommendations about the hottest and newest games from us to you,” the company said in an announcement, noting that “big” publishers like THQ and Deep Silver are already on board—though if we’re being real, THQ and Deep Silver are far from the biggest. In addition, signing up for Discord’s “Nitro” subscription program will now net you a handful of curated “golden” games alongside benefits that were previously included. There will also be indie games on the Discord store, and the company says it will open up a new “First On Discord” program in which it funds indie developers in exchange for temporary exclusivity. The exclusivity window will “usually” last 90 days, Discord says. Lastly, you’ll be able to use Discord to launch any of your games, even if you didn’t buy them on the rapidly expanding communications megalith. The new “Universal Library” feature will scan your machine for games and then handle booting all requisite launchers. Read one way, this just sounds like Discord is trying to make something convenient and comfy. Read another way, it seems like a manifesto aimed at eventual Steam-like dominance. Perhaps it’s something in between. A friendly neighborhood overlord (lol). Interestingly, Discord chief marketing officer Eros Resmini told Variety that the company is doing this in part because it “didn’t want to sell ads or user data,” and in this age of platforms like Facebook farming vast fields of personal info to aid our advertising overlords, that’s at least refreshing to hear. Discord says, however, that chat will remain its “primary” focus, with a current emphasis on performance and new features like priority speaker. The store’s beta is rolling out today to 50,000 Canadian users.